With a wider and higher undercarriage, the EC380DL excavator is taking on the formidable forestry terrains with ease. Operator Mike Harris says the EC380DL’s superior fuel economy and machine performance make it ideal for harvesting large timber. Deep in the Kaingaroa Forest in the North Island of New Zealand, on a patch of logging land so challenging that previous harvesting crews left it behind, an EC380DL crawler excavator from Volvo Construction Equipment (Volvo CE) is clearing up remnants of old Douglas fir and navigating the tough terrain like a champ. 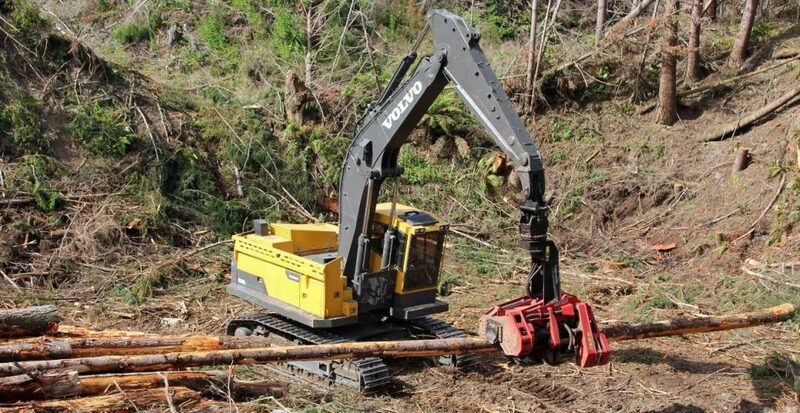 On a landscape that’s crisscrossed with deep gullies and hard to access or negotiate, Harris is using the first EC380DL in New Zealand to fall, trim and process 7-ton plus trees into logs. The company produces around 3,000 tons of logs daily. Harris previously used a second-hand Volvo EC460CL excavator to harvest the large timber. When Harris was looking for a replacement machine, he selected the EC380DL because he had such a good experience with the EC460 CL. Just a couple of months after purchasing the first EC380DL in New Zealand, Harris added a second EC380DL to his fleet in April. The 38-tonne EC380DL is powered by a Volvo 208kW/283hp D13F, Tier 2/Stage IIIB engine to offer 1,700 rpm of power. The crawler excavator features a bucket capacity of 1.35 m3 to 3 m3; 14,540 kg lifting capacity along the undercarriage; a breakout force range between 198 kN to 215 kN; and maximum digging reach of 11,720 mm. 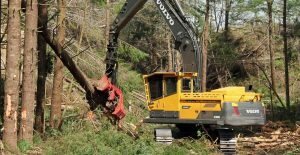 Even though the EC380DL has slightly less reach than the EC460CL, Harris says the EC380DL’s superior fuel economy and machine performance make it ideal for harvesting large timber in New Zealand’s broken terrain and steep conditions. The EC380DL offers 500 mm ground clearance, higher and wider than the EC460CL, and is based on the undercarriage of a 50-ton Volvo excavator. Another reason Harris purchased the EC380DL from long-time Volvo CE dealer Transdiesel was because of the technical knowledge of Ewen Satherley, Timber & Material Handling National Product Manager at the dealership. After seeing where Harris would use the machine, Satherley explained why the slightly smaller EC380DL would work well.